I grew up fly fishing in Northern Nevada in a back pack whistling up fish for my father. I chose Montana State after my collegiate wrestling career because of the great fly fishing and have never looked back. After guiding for 10 years I established Montana Trout Wranglers and I am enjoying every minute of it. My philosophy on guiding is that anyone can have a banner day, but it takes a great guide to make a poor day into a great day. So I have assembled a guide staff that I would want to fish with if I was fishing in Montana. These guys are the most fishy, hard working, professional, and enjoyable guys to spend a day with I have found. We want to make you a better angler and share our secrets to help you catch the trout of your dreams. We don't just fish any one river, we specialize in them all. Whether this is your first time or you have fished the world, you won't be disappointed by our knowledge of the area's rivers and the fishing. When I am not guiding I enjoy fishing with my new puppy dog "Guppy". He loves to float in the boat but hasn't figured out where the trout disappear to when released back into the river. Chuck hails from Enumclaw, Washington and grew up fishing first with spinners and bait, but for the last 15 years focused completely on fly fishing. He graduated from Lewis and ClarkCollege in Portland, Oregon in 1999 and immediately moved to Montana. Chuck has fished many of the waters of the Great Northwest, Chile, and Argentina. He has been a guide in southwest Montana for the last 10 years, and has been blessed to have a "dream job." He has the patience to teach basics to a novice and the experience to help advanced anglers hone their skills while providing a very enthusiastic atmosphere on the river. Tim grew up in Maine where his dad placed a fly rod in his hand at the age of 7. He has many memories of casting to Brook trout from a canoe on secluded ponds in the pine tree state. Tim graduated from Bowdoin College with a BA in biology, received his masters in biomechanics from Montana State University, and has been guiding in Montana, Idaho, and Wyoming ever since. 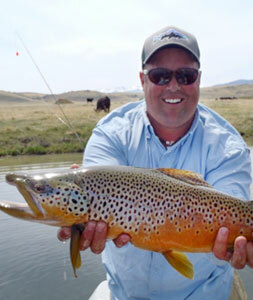 Tim is an extremely passionate and patient instructor who enjoys creating an unforgettable fly fishing experience for all. 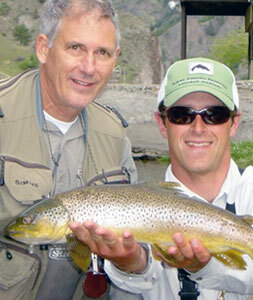 His background in biomechanics allows him to evaluate, analyze, and improve fly fishing techniques in a timely and professional manner. Whether you're a beginner wanting to tackle a new adventure, an intermediate wanting to improve your fly fishing skills (casting, presentation, knowledge of entomology), or an expert seeking to "rip some lips" Tim is the guide for you. Tim lives in Bozeman with his wife Kim, his two children Boone & Eloise, and their Llewellyn setter Adie. During the off season Tim can be found on the slopes as a member of the Bridger Bowl ski patrol. Bert is originally from Virginia, where he grew up fishing waters in the central and southwestern parts of the state. He started fishing with bait and spinners, but was introduced to fly fishing and never looked back. A graduate of the University of Richmond, he taught high school in Virginia for six years before moving to Montana where he currently teaches. As an educator he is passionate about seeing people learn and experience new things and is patient throughout this process. He loves finding new places and water to fish, but also enjoys time fishing familiar waters. Along with fishing, he also enjoys tying and spends a good deal of time doing so through the winter. Bert lives in Belgrade with his wife Rhiannon and two daughters, Hayden and Delaney. 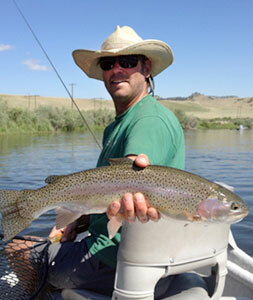 Along with fishing he loves time with his family enjoying the outdoors and pleasures of living in Montana. 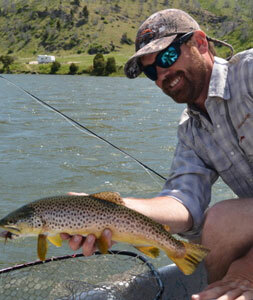 Jason has guided on nearly all of Montana’s blue ribbon rivers, and loves to chase BIG fish. Growing up in a family that loved the outdoors, he spent countless weekends camping around the state, and exploring the many amazing waters Montana has to offer. Jason ended up in college in the southwestern part of Montana, guiding on the Big Hole, Beaverhead, Madison and Missouri rivers. Having so many blue ribbon rivers within such a short distance extended his graduation from college to six years! This added time did help in giving Jason a vast knowledge of the top waters in Montana, and he has been able to find a few places that are virtually untouched. His love of fly fishing, and helping people chase after the big trout has led to some life-long friendships with clients, and great fish stories! 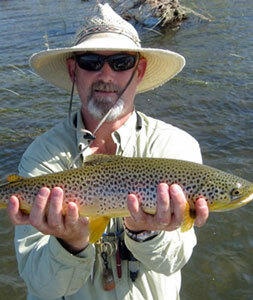 Dain grew up in Maine and began fly fishing at the age of nine. In the past 20 years, he has lived and guided in Wyoming, Idaho, Montana and Alaska. He fell in love with the endless fishing and recreational opportunities Montana has to offer and decided to make Livingston, Montana his home. 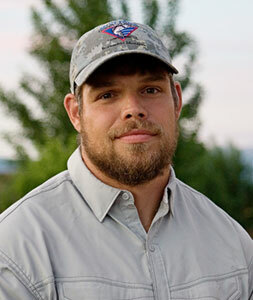 Dain looks forward to sharing his knowledge of fishing and his passion for the outdoors with you. 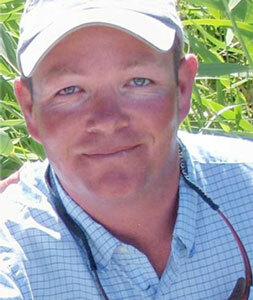 Adam is from Knoxville, TN and was fortunate enough to grow up surrounded by warm and cold-water fisheries. From there he cut his teeth on fishing and knew it was in his blood. When he was 11 he fly-fished the Gallatin and from then he knew that this was the way to catch them. Upon graduating college he decided to pack it up and move west to seek the famous rivers that he could have only dreamed about. Adam is a very patient and diligent guide who loves nothing more than seeing people having fun on the water and learning the art of fly fishing. His passion for the sport is next to none. He has guided in Alaska and New Mexico and spends over 250 days fishing and guiding the waters of SW Montana that he calls home.